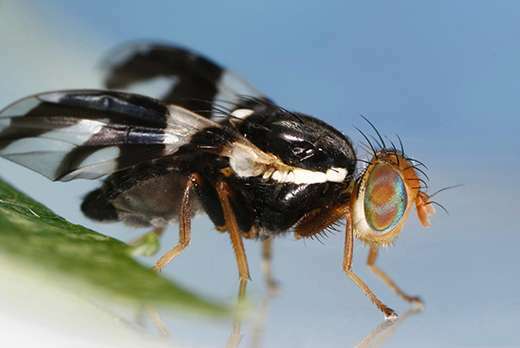 A new study involving a Kansas State University entomologist reveals that the genes of a fruit fly that has plagued American apple producers for more than 150 years is the result of an extremely rapid evolutionary change. Greg Ragland, assistant professor of entomology, is co-lead author on a study involving biologists at Rice University, the University of Notre Dame and several other universities. The study looked at the processes that cause a new species to emerge, which may threaten existing, economically important crops. Scientists think that strong environmental changes, such as a drastic change in seasonal weather, can rapidly "push" different sections of an organism's genome—its genetic blueprint—into changing. For the study, researchers focused on the U.S. fruit fly species Rhagoletis pomonella, or the apple maggot fly. Traditionally, the fly lays its eggs in the fruit of the Hawthorn tree, which is native to North America but not considered economically important because of the fruit's overripe taste. In the 1850s, a small group of these flies began laying their eggs in apples. "At some point the flies jumped to apples, with the adult flies evolving the ability to lay eggs in the fruit and the maggots the ability to consume the fruit," Ragland said. "To do that, regions of the genome had to change from one generation to the next. The result of these flies infesting apples is now a huge issue for the apple production industry because it has introduced a new agricultural pest through an evolutionary event." Apples mature earlier in the year than Hawthorn fruit. Because of this different maturation window, the group of flies had to begin their lifecycles earlier to match the growth cycle of apples, their new host fruit. According to Ragland, these seasonal differences essentially equate to two different groups, or taxa, of the fly—one synchronized with Hawthorn fruit similar to its ancestors and one synchronized with apples. As the behavioral and physical differences in the two flies continue to build each generation, scientists think they may be seeing the formation of a new species. Work starting as far back as the late 1800s began to reveal these observable differences. This new study builds on that work by showing that environmental differences can change many regions of the genome on time scales even shorter than 150 years. Researchers discovered this process of rapid adaptation through experiments that looked at the evolutionary differences in the genomes of both flies. They collected flies that laid eggs in Hawthorn fruit and raised one group under seasonal conditions typical of either native Hawthorn fruit or apple-infesting populations. Researchers found that they could replicate the shift from Hawthorn fruit to apples first seen in the 1850s even though all of the flies in the experiment initially laid their eggs in Hawthorn fruit. "The rapid pace of evolution required to produce the apple-infesting group was initially a surprising result," said Scott Egan, assistant professor at Rice University and co-lead author. "Our results are even more surprising, though, showing that just a few generations of natural selection may have generated apple fly populations that physically and genetically resemble the ones that we see today." Initially, the team sequenced the genomes of both Hawthorn and apple flies. Following the experiment, they sequenced the flies reared under the short-term Hawthorn-like and apple-like conditions. They found pronounced differences between the short-term rearing conditions across the entire genome. When they compared these results, they found that the genetic changes from the short-term experiment lined up almost completely with the genetic changes between the Hawthorn and apple groups. "This suggests that many regions of the genome may evolve in as little as a few generations," said Jeff Feder, professor at the University of Notre Dame and co-author. "The genome-wide changes we observe are very likely the result of environmental differences that are driving the formation of new species." In addition to observing the evolutionary "jump" between host fruits by the two flies, the study sheds new light on how seasonality affects evolution. Better understanding these evolutionary shifts may help scientists better predict when these shifts could happen and what new agricultural pests may result. "One of the big takeaways is that species are not static; they are fluid to the environment they live in," Ragland said. "From an evolutionary perspective, environmental change can lead to very pronounced genomic differences over very short time scales. They can potentially change all kinds of traits." The study, "Experimental evidence of genome-wide impact of ecological selection during early stages of speciation-with-gene-flow," will appear in an upcoming issue of the scientific journal Ecology Letters. Cue the creationists, who can explain how we are witnessing an 'intelligent designer' at work.